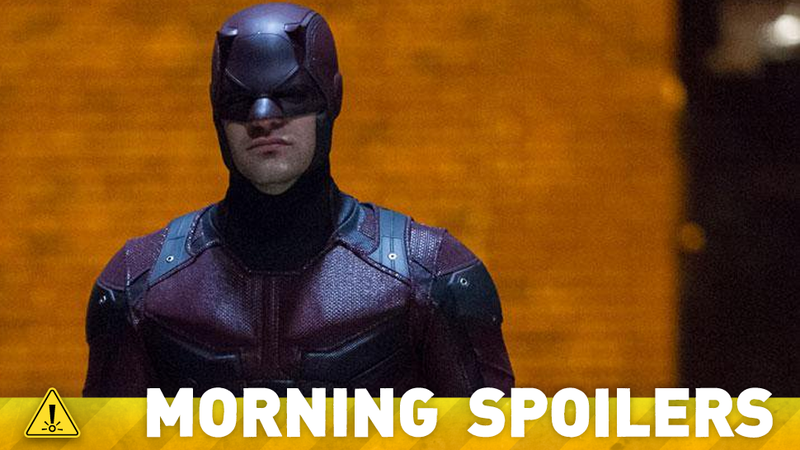 Superhero Roundup: Rumors and Hints For Punisher, X-Men, Jessica Jones and Dr. Strange! X-Men: Apocalypse could add a lot more Wolverine. Get a look at the heroes of the Warcraft movie. Jessica Jones’ entire first season gets some teasing descriptions. Plus, new looks at this week’s Doctor Who and iZombie, a bizarre theory about Game of Thrones’ delay, and a new Hunger Games clip. Behold, Spoilers! Meanwhile, Director Duncan Jones tweeted that the first publicly released trailer for the film will make its debut on Friday, during the keynote speech for Blizzcon, Blizzard Entertainment’s own fan convention. Katniss vows to kill Snow in a new clip from the film. Ever since rumors began earlier this year, people have been discussing the chances of Iron Fist’s Netflix series actually happening. A new rumor from Peel the Orange adds a twist to the often-rumored cancellation of the series because of difficulty in adapting Danny Rand’s mystic kung fu adventures. Rumor has it, Marvel is indeed scrapping Iron Fist as a Netflix show... and instead using the service to create an Iron Fist movie. The Punisher, played by Jon Bernthal in Daredevil season 2, could fill Iron Fist’s place in the four-series deal, and eventually become the fourth Defender in a crossover with Daredevil, Jessica Jones, and Luke Cage. As ever with unsourced rumors like this, take it all with a pinch of salt. AKA Ladies Night : Jessica Jones is hired to find a pretty NYU student who’’s vanished, but it turns out to be more than a simple missing persons case. AKA Crush Syndrome: Jessica vows to prove Hope’s innocence, even though it means tracking down a terrifying figure from her own past. AKA It’s Called Whiskey: It won’t be easy to acquire or deploy. but Jessica thinks she’s found a weapon to use against Kilgrave. Luke and Jessica bond over their similarities. AKA: 99 Friends : A new case demands attention as Jessica tries to find out who’s spying on her for Kilgrave. Trish’s radio show yields unexpected consequences. AKA The Sandwich Saved Me : Despite Jessica’s objections, Trish’s new friend Simpson gets involved in the hunt for Kilgrave. Jessica recalls a pivotal moment in her life. AKA You’re a Winner: Luke hires Jessica to help him find someone who may have skipped town, but she fears he’ll learn too much about her history in the process. AKA WWJD: Jessica experiences a strange homecoming courtesy of Kilgrave. Hogarth’s conflict with her estranged wife reaches a tipping point. AKA Sin Bin: Just when Jessica has Kilgrave right where she want’s him. Hogarth’s involvement complicates the situation. Details of Kilgrave’s past emerge. AKA 1,000 Cuts : A discovery has the potential to change the entire game — if Jessica can refuse Kilgrave’s offer. AKA I’ve Got The Blues: Jessica searches morgues for clues. Trish goes all out to keep Simpson from getting in Jessica’s way. Malcom has an epiphany. Game of Thrones is a show so laden with speculation and fan theories that even the thought of the series being delayed has prompted rumors. Film School Rejects claims that the recent news that the show’s sixth season won’t air until at least late April is because the show, which will feature a major storyline about the resurrection of Jon Snow, will save that “reveal” for the upcoming sixth novel in the A Song of Ice and Fire saga, The Winds of Winter. Thus, the episodes featuring Jon Snow’s return will only air after the book releases. Considering there’s still no solid date on the book’s arrival, this theory is perhaps extremely unlikely. There is a couple in the back half. You know what’s ironic, I had an awesome walker cameo that we put in a scene in episode six but in the editing process the scene was removed so the tribute walker got cut out. I’m still gonna do it at some point but I feel like after the fact, I missed a great opportunity. Because of the black and white in 6x01, I would’ve had a perfect opportunity to do a Night of the Living Dead homage and actually shoot a zombie in black and white and make it look like a scene from Night of the Living Dead. I kind of missed the boat a little bit there because I hadn’t anticipated that opportunity was gonna be there but there’s some great tribute walkers coming up for sure. There could be a little Tarman Return of the Living Dead, there could be another Dawn of the Dead... I put them in because I love doing them for us. You do thousands of make-ups and to have an opportunity to recreate a make-up or a character that you just loved, that inspired you, it’s sort of my nerd-version of paying back. Did I know much about the character? Are you joking me? Hellgrammite, I didn’t even know how to say the name, let alone know about it. But i love doing research, so after reading up on my Hellgrammite, I got to really love the character. I’ve been lucky enough to audition for a handful of villains in the D.C. Universe through The Flash. That’s how I got to know Greg Berlanti. Every time I had the opportunity to audition for one of these guys, I mean, it’s like, you’re a kid. The opportunity to play a villain, I always thought I’d want to be the hero, but it’s kind of this, it’s been this great sort of twist of fate. You are going to be the first, the first to make the humans see. Don’t look at my browser history! This is us being blown up with a big bazooka! The first thing I’d do if I wanted to invade the world would be to kill you. You’ve gone quiet because I mentioned Clara. Clive’s new co-worker distracts him from his latest case in a new clip from “Love & Basketball”. Finally, Emily Beecham’s Widow gets in an elaborate fight in a new clip from the series. Additional reporting by Gordon Jackson and Charlie Jane Anders. Image: Daredevil.